Abstract | Music-streaming services have disrupted the music industry’s established commodity formats and place-bound consumer experiences, producing seemingly limitless and algorithmically driven modes of listening. These music services target a global audience, as evident in Soundcloud’s promise to enable audiences to “hear the world’s sound.” This article maps out the deployment of local regions as tags and metadata in music-streaming services, arguing that there is a reconfiguration of locality evident, what I dub the indexi-local. This portmanteau—coordinating the terms index and local—grasps at the effort to design a participatory platform experience vis-à-vis local regions. This article undertakes a close reading of the interfaces of two music-streaming services: Bandcamp and Soundcloud. First, metadata is shown to play a significant role in the design and operations of digital music platforms, not only organizing the circulation of data but also generating listening recommendations. Second, the circulation of local regions as metadata within these two services’ interfaces is then highlighted in the tagging activities of platform users. While the circulation of local regions as metadata imbricates with broader efforts to create a more participatory and place-bound streaming experience, it also flattens local differences into a gray media aesthetic of hashtags and geotagged text. Résumé | Les services de diffusion de musique ont perturbé les formats de produits établis par l’industrie de la musique et les expériences de consommation liées aux lieux, produisant des modes d’écoute apparemment illimités et basés sur des algorithmes. Ces services de musique ciblent un public mondial, comme le prouve la promesse de Soundcloud de permettre au public « d’écouter les sons du monde ». Cet article décrit le déploiement des régions en tant qu’étiquettes et métadonnées dans les services de diffusion de musique, en faisant valoir qu’il y a une reconfiguration de localité évidente, que je surnomme l’indexi-local. Cette expression, qui combine les termes index et local, capte l’effort de concevoir une expérience de plate-forme participative vis-à-vis des régions. Cet article effectue une lecture approfondie des interfaces de deux services de diffusion de musique : Bandcamp et Soundcloud. Tout d’abord, les métadonnées sont présentées comme jouant un rôle important dans la conception et l’exploitation des plates-formes de musique numériques, non seulement en organisant la circulation des données, mais aussi en générant des recommandations d’écoute. Deuxièmement, la circulation des régions comme métadonnées dans les interfaces de ces deux services est alors mise en évidence dans les activités de marquage des utilisateurs de plateformes. Alors que la circulation des régions en tant que métadonnées se superpose avec des efforts plus larges pour créer une expérience de diffusion plus participative et liée au lieu, elle réduit également les différences locales à une esthétique morne de médias de hashtags et de balises géographiques. Second, and tied to this touristic application, Spotify also uses the data collected from its listening base to generate recommendations for other users of its streaming platform. Spotify’s musical maps invite listeners to engage with this music-streaming service by stepping outside their genre interests and trying to listen, instead, with geographic locations guiding the way. I begin with this example because it gestures to the central concern of this article: the circulation of local geographic regions as user-generated metadata within two digital music platforms, Bandcamp and Soundcloud. On the one hand, I pinpoint how the region-oriented tags produced by users facilitates the organization and retrieval of musical data uploaded to these music platforms; on the other, I suggest that a “local feel”—defined, following J. Berland, as the narrative production of local regions within commercial media sites (190-191)—emerges in both platforms through the articulation of local regions to such metadata-specific functionalities as generating recommendations and facilitating frictionless platform navigation. To capture the articulation of locality to metadata I deploy the term indexi-local: a portmanteau that collapses the terms index and local to describe the tendency in these two platforms to design a participatory platform experience based in users’ tagging of local regions. To establish the indexi-local, I examine the tagging of local regions through a closer reading of Bandcamp and Soundcloud’s interfaces. J.W. Morris and D. Powers define an interface as “all that greets a user when she/he starts up a service, including design, features, content organization, navigational options, etc., as well as the affective pull this combined assemblage has on users” (110). The interface is a key part of digital platforms that, moreover, works to “shape how users see, hear, feel, and experience the functions of any given piece of software and the cultural content that passes through it” (Morris, Selling Digital Music 18). Interface design both guides and enframes everyday interactions with different software, platforms, and websites. To illustrate data’s region-oriented emplacement, I include several screengrabs of these tagging practices. This work follows previous interface-oriented studies of digital media (see Bolter and Grusin; Manovich; Galloway). Drawing on M. Fuller and A. Goffey’s work on “gray media” – which examines the functionality produced in such administrative sites of digital mediation as spreadsheets and databases – this article considers the indexi-local as a more functional articulation of local regions, stylized as hashtags and lists of geotagged text circulating through these two music platforms. I conclude by suggesting that the indexi-local signals the place and value of local music-making regions within the broader reconfigurations of commodity forms and audience experiences connected to the current “new music economy” that hinges on social media platforms, user-generated content, and increasing participation from consumers in valorizing, promoting, and distributing music (see Galuzska; Morris, “Artists as Entrepreneurs”; Morris and Powers). The e-retailer went online in 2008 and offered musicians a customizable artist page free of in-page advertisements. Artist account-holders are responsible for a diverse range of activities, including uploading songs; providing and editing information relating to sound recording, artist biographies, etc. ; preparing and uploading artist and album artwork; setting prices; processing, shipping, and receiving orders of physical albums and merchandise; and generating tags that categorize both albums and artist. Soundcloud ascribes distinct URLs to the audio files circulating within the platform, which can then be embedded in a variety of websites. This enables the easy sharing of tracks. Meanwhile, comments can be posted within the service’s audio player, which is stylized as a visualization of the song’s waveform (a visual facsimile of a song’s volume and sound dynamics). Interested listeners provide feedback by clicking on a part of the song’s waveform and posting their comments there. 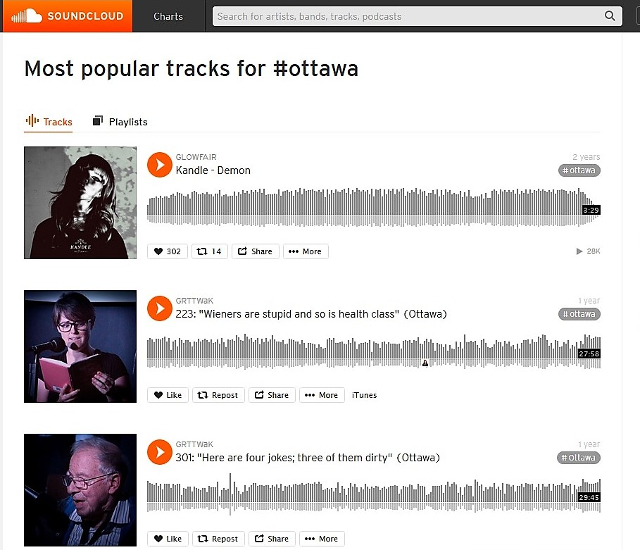 The visualization of waveform typical in Soundcloud’s audio player can be seen in the below screengrab of the track “Pools of Iris” associated with the account of the Ottawa-based independent electro-pop musician Pippa (https://soundcloud.com/pippalouu). Both Bandcamp and Soundcloud are audio platforms that, like social-media services Facebook and Twitter, emphasize social connectivity and operate through the user-generated content. Both services promise, moreover, social connectivity for users; Bandcamp promises both listeners and musicians a platform with which to “discover amazing new music and directly support the artists who make it” (www.bandcamp.com). Soundcloud, meanwhile, promises its subscribers a platform that will “help you connect with fans and grow your audience” (www.soundcloud.com). Morris and Powers argue that streaming services advance, through discourse, interface design, and marketing, “branded musical experiences that target certain styles of musical discovery and use as they vie for consumers” (109-110). The next section highlights how the promises of discovery, support, and connection advanced by both Bandcamp and Soundcloud intertwine with the region-oriented tagging practices of users. The tagging practices circulating through and evident in both Bandcamp and Soundcloud work as user-generated metadata. A.G. Taylor and D.N. Joudrey define metadata as the “data about data” that “describes the attributes of information resources for the purposes of identification, discovery, selection, use, access, and management” (89). Examples of musical metadata include song names, album titles, artist names, and genre. In these instances, metadata is the information that enables its search and retrieval within different digital platforms (Morris, “Making Music Behave” 851-853). Metadata is particularly useful in digital settings it works to organize and categorize the data constantly (over-)accumulating (Boehm; Manovich 221-225). L. Gitelman observes, moreover, that metadata is embedded at both visible and invisible layers within digital media objects. Writing about DVD discs, she explains: “All of the information on a DVD menu that users watch are data; the information they do not watch are metadata. Some metadata become visible in menus and titles, but a lot more remain unseen” (142). Tags operate as visible and user-generated metadata within these two platforms. Considering the tagging activity in Bandcamp, genre and local region are the most typical tags deployed. There is no pre-set template for genre tags, so they range from more standard descriptors as “indie,” “punk,” and “folk,” to more idiosyncratic ones, such as “Ouija rock,” which is utilized by the Ottawa-based punk rock band The Yips (https://yips613.bandcamp.com/). The other popular tag is for geographic region, largely based in the cities or towns with which artists self-identify. For example, the Ottawa-based indie rock group The Yips deploy two tags for Ottawa: Ottawa with a lower-case O and upper-case O. (Image 2). There are also bands that tag for multiple cities, as with the punk group Best Fiends, which tags the cities Toronto, Montreal, and Ottawa in its profile and album page (https://bruisedtongue.bandcamp.com/album/best-fiends). The tagging of geographic regions circulates throughout the artist pages of Bandcamp account holders, ranging from smaller-scaled groups with regional popularity like The Yips, to more internationally renowned groups like Fugazi, who also embed a tag for the city “Washington DC” (https://fugazi.bandcamp.com/) within their artist and album pages on Bandcamp. While these groups are aligned to the punk rock genre, a wide range of independent and unsigned musicians working in different genres utilize the platform and tag for geographic region as well, including the London-based electronic/dubstep musician Burial (https://burial.bandcamp.com/); New York-based hip-hop artist KRS-One (https://krsone.bandcamp.com/album/the-world-is-mind); and Durham, NC-based indie rock group The Mountain Goats (https://themountaingoats.bandcamp.com/album/goths-deluxe-version). The repeating reference to local regions in both platforms signals the historical and contemporary value of local music scenes in the formation and circulation of many of the music genres represented within both services, including electronic dance music (Reynolds); punk rock (O’Connor); hip hop (Harrison); and indie rock (Shank; Kruse). Studies of music scenes tend to examine the local media sites, social and professional networks, and musical players that shape the emergence and circulation of certain music genres (Cohen; Shank; Crossley). A focus on music scenes can reveal the important role that such sites as live music venues, rehearsal spaces, recording studios, music stores, and local media (such as zines and campus radio) play in providing the “soft infrastructure” on which social relations, musical practices, and economic activity rests (O’Connor). Working with Brian Eno’s concept of “scenius,” S. Reynolds surmises that a focus on music scenes reveals the important role that social milieu plays in shaping the formation and circulation of music, which challenges myths of music creation based in autonomous genius (527). Whether banal infrastructure or revealing the musical influence of social relations, music scenes underpin the production of much of the music represented in both platforms. Kruse has shown in her work on music scenes and indie rock that the value and meaning of indie rock is actively produced by scene participants through both their discursive articulations of and affective investments in music at the level of the local music scene. More precisely, she finds a recurring tendency for scene participants to construct both their personal biographies of music fandom and indie music’s history through their own investment and involvement in their local music scene (Site and Sound 12-13). Research into the adoption of social media and e-retail platforms by musicians has highlighted their fit within the existent cultural, economic, and social activities of music scenes ( Kruse, “Local Identity”; Sargent). Following Kruse’s insight into the centrality of identifying and creating music via local regions in indie music scenes, in Bandcamp the tagging of local regions locates and identifies musical data uploaded by musicians and labels to this platform, indicating the social and geographic regions in which these users are situated. Moreover, the tendency for these local tags to cut across different genres not specific to indie rock suggests that locality—that is, relating to a specific region vis-à-vis music and media (Bennett 63; Kruse, Site and Sound)—continues to be significant in the production, distribution, promotion, and organization of music uploaded to these platforms. Diamond’s suggestion that community will emerge in Bandcamp through tagging enacted by different account holders resonates with H. Jenkins’ research into the production of “collective intelligence” within online settings. Following the lead of French philosopher of cyberspace Pierre Lévy, Jenkins distills collective intelligence into the following slogan: “None of us can know everything; each of us knows something; and we can put the pieces together if we pool our resources and combine our skills” (4). Jenkins identifies collective intelligence in the online sites and spaces in which media users and fans collaborate and produce culture, whether looking to “spoiler groups” that agglomerated around the reality television series Survivor or the collaboratively produced online encyclopedia Wikipedia. Diamond sees community emerging in the contributions made by users of the platform to categorize and describe the music they upload to the platform. However, while the music uploaded to the service fits within the broader reliance on the decentralized circulation of user-generated content evident in social media platforms, with tags we also see a more precise form of “collective intelligence” emerging, whereby the terms mobilized to describe music not only work to categorize and describe the individual musical products uploaded by musicians and record labels but also the broader aggregate of music uploaded to the platform by different users. Indeed, the tags generated by users of this platform become conventional terms to mobilize, thereby indicating a collectively produced form of information management by platform users. While Bandcamp’s reliance on users to tag signals the collective intelligence of platform users contributing, it also places the burden of data management away from the platform’s engineers and towards the individuals uploading data to this service. This does not exactly count as “free labour” performed by users of this platform to make it work better (see Terranova; Srnicek), because the musicians and labels selling and promoting music with Bandcamp are not exactly unreimbursed; rather, it is a sort of informational work performed by platform users that makes the platform work better. We can see tagging as extra informational work performed by platform users that facilitates platform navigation, which is entangled with the already-existing creative labour performed by musicians and record labels to create, sell, and promote music (Stahl). This section has highlighted a repeating tendency for local regions to emerge in the tags circulating through both Bandcamp and Soundcloud. These tags reflect the “collective intelligence” of both platforms’ user bases; emerge as extra informational labour performed by platform users; and gesture to the fit of these platforms within the scene-bound musical and entrepreneurial activities of record labels and musicians. However, these media are also gray because they closely intertwine with the various administrative practices to which they are deployed, thus becoming invisible. Or, as Fuller and Goffey explain, “Grayness is a quality that is easily overlooked, and that is what gives it its great attraction, an unremarkableness that can be of inestimable value in background operations” (11). Gray media are, in short, administrative and function-oriented media forms that are largely used as means to achieve specific ends. One may not necessarily think of them as distinct media forms unto themselves until they stop working (as for instance, when a Word Document crashes). Their work on gray media is suggestive in its accounting for the ubiquity of administrative media forms within the everyday lives of media users. Keeping in mind this special issue’s focus on the visualization and emplacement of data, I argue that the indexi-local is a gray and platform-specific “local feel,” to use Berland’s term. As seen in the screengrabs, there is a degree of aesthetic “unremarkableness” evident in these tags, which circulate in Bandcamp as hyperlinked text listed within the album and artist pages of account holders and hashtags. While the artist and album pages are customizable in both Bandcamp and Soundcloud—with musical acts able to upload album art, select font colours, page colours, etc.—both tags appear as simple text embedded in different regions of the webpage. In Bandcamp, tags are listed at the bottom of album pages; in Soundcloud, it is a hashtag embedded in the audio player. Moreover, Soundcloud users also have the option to identify geographic regions in the biographical information posted to the profile pages of Soundcloud users. Consider the stylization of local regions as profile information in the screengrab posted below of the Ottawa-based indie electro-folk group The Acorn (Image 4). In The Acorn’s profile, the listing of location in profile information appears as simple text, stylized and formatted in the same colour and font as the musical act and members. Again, there is aesthetic unremarkableness, or indeed, a quality of grayness in subsuming local regions to biographical information listed in a profile. When one clicks through the region-oriented tags circulating within Bandcamp, two types of search results appear: other items that have been tagged with that tag by that musician, and other music that has been categorized with that tag. In the frictionless navigation of pages, local regions are articulated as metadata generating further listings of music to stream and purchase. 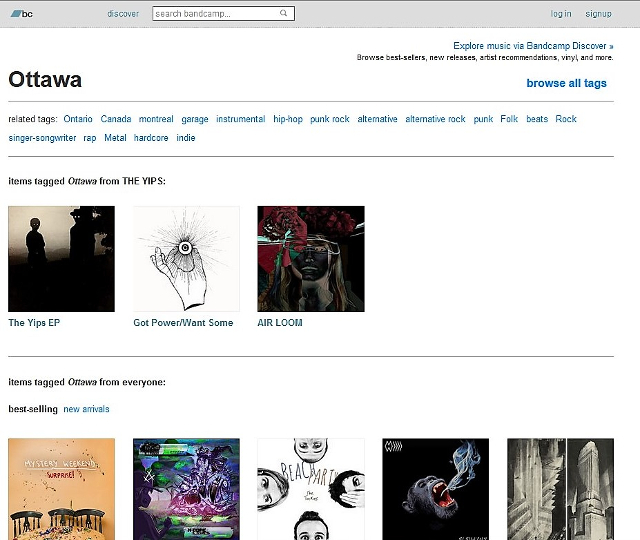 For example, clicking through the “Ottawa” tag within The Yips’ Bandcamp page produces results for albums released by the group that have also been tagged with that tag; other albums and artists that have used that tag; and a list of “related tags” with which listeners can further explore the service (Image 5). These results emerge across all instances of region-based tagging. Similarly, clicking through the hashtag embedded in Soundcloud’s audio player produces a list of audio files featuring that tag, broken down in terms of popularity for individual audio files and playlists (Image 6). In both instances, tags create lists of further listening recommendations. J.D. Peters has argued that lists are both a symptom of and strategy to deal with “information abundance” in digital milieus (9); similarly, the list of results opened by this tag reflects the quantity of data uploaded to these platforms and provides platform users a means with which to navigate through the data contained in these platforms. In Media Ecologies (2005), M. Fuller performs a formal analysis of lists, suggesting that lists accrue significance through the connections generated in-between any given item placed on a list. More precisely, he argues that lists possess a sort of “compositional” logic, whereby each element in a list produces a broader “communicative dynamic” (15). The “communicative dynamic” emerging in these instances of tagging involves engineering data interconnections to generate recommendations. Indeed, hashtags are an everyday part of social media websites such as Instagram and Twitter and they provide users with a means to render their social-media posts searchable, groupable, and part of larger social-media trends. In relation to social-media activism, hashtags articulate networked connections between posts, producing larger aggregates of protest messages as social-media postings (Scott). The use of hashtags fit, moreover, within the increasing tendency for users to perform “interpersonal search” in social-media platforms. M. Zappavigna explains: “This cultural shift to interpersonal search has resulted in the emergence of searchable talk, that is, online discourse where the primary function appears to be affiliation via ‘findability.’ This kind of talk . . . incorporate[s] metadata into language so that online talk can be found” (789). 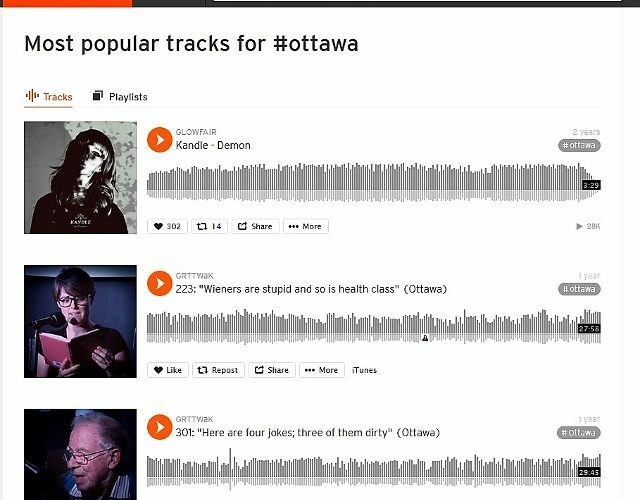 As the screengrab listing the results for the tracks and playlists categorized as #Ottawa (Image 6) depicts, there are a range of individuals using Soundcloud who hashtag local regions to align their tracks, podcasts, and/or playlists with others. This facilitates the findability of these tracks via the tagging of local regions. Writing about localness in Canadian commercial radio broadcasts, Berland unpacks and identifies how a “local feel” is produced in Canadian commercial radio to “appeal to” both advertisers and listeners (189). Localness is not intrinsic to Canadian commercial radio; instead, the feel of locality is produced, more precisely, through such narrative means as: DJ banter identifying local events, locally focused news updates, and broadcasting commercials for local businesses (189-191). These elements re-code commercial radio as a local media production (though localness can also be established in the signal limits of terrestrial radio stations). Similarly, I would like to suggest that there is a “local feel” being produced in these platforms through the deployment of region-specific tags. Specifically, in Bandcamp and Soundcloud, these instances of user-generated metadata both describe musical data uploaded to these platforms and generate connections between musical data identified with that regional tag. This fits with Morris’ argument that “metadata plug users into a vast repository of commodities on the internet, where the act of listening to a song triggers advice to purchase music by similar-sounding bands, related merchandise, or other linked media properties” (“Making Music Behave” 860). The indexi-local articulates and visualizes these connections between musical data circulating within this platform as lists and tagged text. The functionality of these instances of region-oriented metadata is reflected in the very aesthetics of tagging: a gray and platform-specific “local feel” oriented towards enabling, on the one hand, the frictionless navigation and retrieval of musical data uploaded to these platforms, and on the other, recommendations for further listening, streaming, and purchasing options. Scholars have identified a “new music economy” that has disrupted music’s established commodity forms and producer/consumer relationships (see Galuzska; Morris, “Artists as Entrepreneurs”; Morris and Powers). This new music economy privileges “features like social connections and contributions (between fans and artists, fan-generated reviews and playlists, etc.) in lieu of sales of discrete objects” (Morris and Powers 109). While Bandcamp still sells “discrete objects,” this article has emphasized how forms of user-generated contributions, social connection, and participation emerges in the collective and regionally oriented tagging practices circulating through both music platforms. The indexi-local, moreover, signals the place and value of local regions within these two music platforms to organize data, generate recommendations, and facilitate frictionless navigation. While further research is needed to identify the social, emotional, and professional needs that these practices of region-oriented tagging meet for users, it is evident that both local regions and these music platforms operate as mutually beneficial “way-finding aids” (Straw413). Indeed, the tagging of local regions enables users not only to sift through the density of musical activity transpiring in a local music-making region with that platform but also locate music within that platform via local regions. This focus on metadata reveals a platform-specific “local feel,” produced by re-articulating local music-making regions to metadata-specific functionalities of categorization, connection, and retrieval. While one can potentially, as Soundcloud promises users, “hear the world’s sound” (www.soundcloud.com) in and through these music platforms, this world of musical data is navigated, organized, and emplaced through the aggregation of user-generated and region-oriented tags generated by users of these two music platforms. Audette-Longo, Michael. Shine A Light: Surveying Locality, Independence, and Digitization in Ottawa’s Independent Rock Scene. Diss. Carleton University, 2016. Web. 23 Aug. 2017. Bennett, Andy. Popular Music and Youth Culture: Music, Identity and Place. Palgrave, 2000. Berland, Jody. “Radio Space and Industrial Time: Music Formats, Local Narratives, and Technological Mediation.” Popular Music 9, 2, 1990, pp. 179-192. Boehm, Carola. “The Metadata Bear. Or: Bearing the Weight of Accessibility.” Journal of Educational Media, 24, 3, 1999, pp. 177-189. Bolter, JayDavid and Richard Grusin. Remediation: Understanding New Media. MIT Press, 1999. Cohen, Sara. Rock Culture in Liverpool: Popular Music in the Making. Clarendon Press, 1991. Crossley, Nick. “Pretty Connected: The Social Network of the Early UK Punk Movement.” Theory, Culture & Society, 25, 6, 2008, pp. 89-116. Fuller, Matthew. Media Ecologies: Materialist Energies in Art and Technoculture. MIT Press, 2005. Fuller, Matthew and Andrew Goffey. Evil Media. MIT Press, 2012. Galloway, Alexander R. The Interface Effect. Polity Press, 2012. Galuzska, Patryk. “New Economy of Fandom.” Popular Music and Society, 38, 1, 2015, pp. 25-43. Gitelman, Lisa. Always Already New: Media, History, and the Data of Culture. MIT Press, 2006. Harrison, Anthony Kwame. “‘Cheaper than a CD, Plus We Really Mean It:’ Bay Area Underground Hip Hop Tapes as Subcultural Artefacts.” Popular Music, 25, 2, 2006, pp. 283-301. Kruse, Holly. “Local Identity and Independent Music Scenes, Online and Off.” Popular Music and Society, 33, 5, 2010, pp. 625-639. —. Site and Sound: Understanding Independent Music Scenes. Peter Lang, 2003. Morris, Jeremy Wade. Selling Digital Music, Formatting Culture. University of California Press, 2015. —. “Artists As Entrepreneurs, Fans As Workers.” Popular Music and Society, 37, 3, 2014, pp. 273-290. —. “Making Music Behave: Metadata and The Digital Music Commodity.” New Media & Society, 14, 5, 2012, pp. 850-866. Morris, Jeremy Wade and Devon Powers. “Control, Curation, and Musical Experience in Streaming Music Services.” Creative Industries Journal, 8, 2, 2015, pp. 106-122. O’Connor, Alan. “Local Scenes and Dangerous Crossroads: Punk and Theories of Cultural Hybridity.” Popular Music, 21, 2, 2002, pp. 225-236. Peters, John Durham. The Marvelous Clouds: Towards A Philosophy of Elemental Media. The University of Chicago Press, 2015. Reynolds, Simon. Energy Flash: A Journey Through Rave Music and Dance Culture. Soft Skull Press, 2012. Sargent, Carey. “Local Musicians Building Global Audiences: Social Capital and the Distribution of User-created Content On- and Off-line.” Information, Communication & Society, 12, 4, 2009, pp. 469-487. Scott, Suzanne. “#Wheresrey? : Toys, Spoilers, and the Gender Politics of Franchise Paratexts.” Critical Studies in Media Communication, 34, 2, 2017, pp. 138-147. Shank, Barry. Dissonant Identities: The Rock ‘n’ Roll Scene in Austin, Texas. Wesleyan University Press, 1994. Srnicek, Nick. Platform Capitalism. Polity Press, 2017. Stahl, Matt. Unfree masters: Recording artists and the politics of work. Durham, NC & London: Duke University Press. Straw, Will. “Cultural Scenes.” Society and Leisure, 27, 2, 2004, pp. 411-422. Taylor, Arlene G. and Daniel N. Joudrey. The Organization of Information (3rd ed.). Libraries Unlimited, 2009. Terranova, Tziana. “Free Labour: Producing Culture For the Digital Economy. Social Text, 18, 2, 2000, pp. 33-58. Zappavigna, Michele. “Ambient Affiliation: A Linguistic Perspective on Twitter.” New Media & Society, 13, 5, 2011, pp. 788-806. In an earlier study, the indexi-local was identified in the online radio station CBC Radio 3 and argued to operate as a “virtual image” of local music scenes (Audette-Longo). In doing so, it looked to the “experiential potentiality” of participating in a local music scene vis-à-vis this online radio station (516). This article further builds on this initial study of how styles of participating in independent music overlap local music scenes and a single digital music platform by considering the tagging practices of platform users. Moreover, because this article branches off from a broader study of independent music within Ottawa, Ontario’s indie rock scene (Audette-Longo, “Shine a Light”) the examples of tagging included below deal with Bandcamp and Soundcloud accounts based in Ottawa.